When you have an asset, you want to protect it as best you can. There’s no greater asset for your oral health than your teeth. If you fail to protect your teeth, they may face severe damage, and you can even lose them eventually. To avoid tooth loss, you should regularly brush and floss your teeth. If you do develop an issue like a cavity, treating it as quickly as possible is in your best interest. For teeth that have been compromised by bacterial decay or physical damage, dental crowns provide amazing protection for the future. 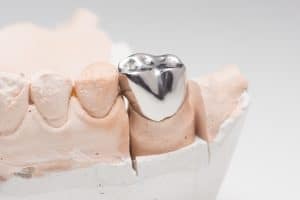 If you’re unfamiliar with dental crowns, your first question might be, “How do dental crowns work?” Dental crowns are fabricated using precise measurements of your actual teeth. The crown fits over a vulnerable tooth and prevents bacteria from entering the tooth or hard food from causing damage to a cracked tooth. This protects your tooth in the long-term. Dental crowns are so helpful for dentists and patients alike because they address a wide variety of conditions. If your cavity has gotten out of hand and a dental filling won’t provide complete structural recovery, a dental crown may help. If your tooth needs a root canal, the base structure may be compromised, and a crown can be added. If your tooth has been chipped or cracked because of an accident, a crown is often the answer. Dental crowns can be made from a number of materials to suit your particular situation. Hard metals, like gold alloy, can be used to create strong crowns that stand the test of time. Other materials like dental porcelain are preferred for their tooth-like color. The type of crown that works best for you will depend on your personal needs. If your tooth is damaged, you need to protect it for the future. You need a state-of-the-art dental crown that will keep bacteria and physical objects from harming the tooth. Melrose Dental Arts will work with you to choose a crown that fits your personal needs. Make your appointment for a consultation by contacting Melrose Dental Arts in Vista, CA at 760-724-9117.